Progress has taken many forms over the course of human history. Efforts to shape a better world are often multi-generational and implemented with the collective resources of nation states. But this is slowly changing with the advent of globally networked computing systems and is creating new frontiers and challenges for how progress is defined. At no other time in history has the influence of individual contributions to technological advancement had such significant impact on the speed of progress for human development. The rapid adoption of computing technology in our daily lives within a single generation is evidence of this. The GVU Center fits within a special niche of technology researchers who are helping to bring about computing innovations and seek to use them to influence a greater social good. 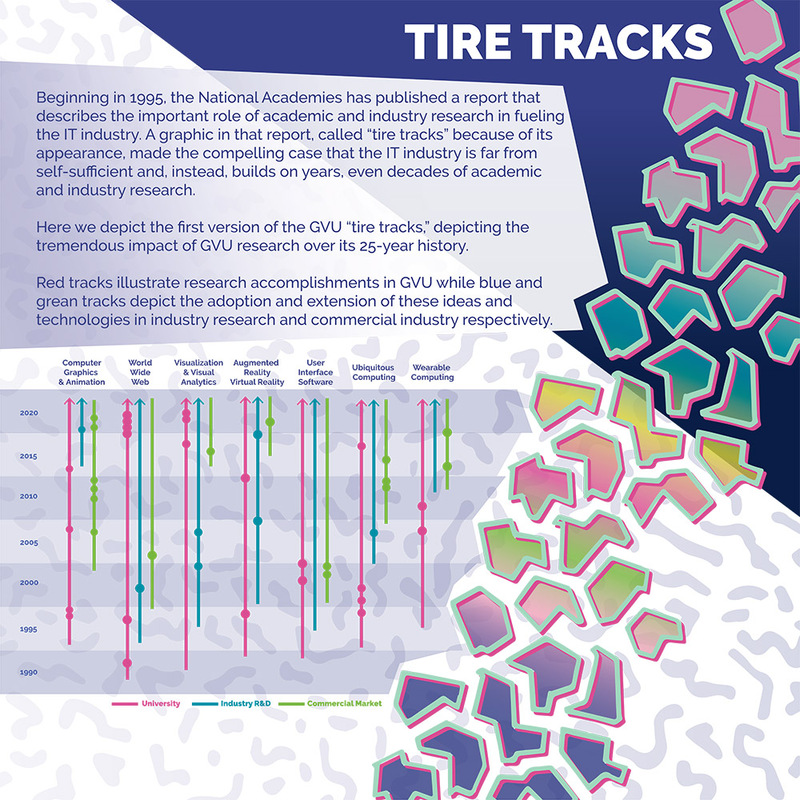 The broad impact of the GVU Center's research community over the past quarter century has influenced the shape of computing research in dozens of fields and domains as it relates to human interaction with technology. On Oct. 18 and 19, the GVU Center celebrated its 25th anniversary, recognizing the work and people on which the foundation for a better future is being built and setting new goals to aspire to in advancing the human condition through technological innovation. The GVU Center was founded 25 years ago to advance key research for computer interfaces and how they related to graphics, visualization, and usability (GVU). This was a time when desktop PCs were on the rise and coding was still far from common in schools. Now computing technology is at the center of everyday living in many parts of the world, a fact that has fundamentally changed our relationship with technology and one that GVU has embraced. 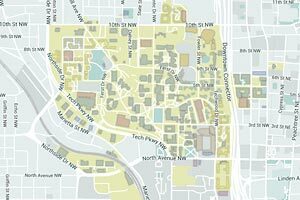 The Center now focuses on 23 core research areas as well as other domains that are being advanced by computing. GVU brings together teams that are able to envision and prototype technology innovations that help to improve communities and conditions for human development. As GVU has grown in size to almost 400 faculty, research scientists, and graduate students, it has remained committed to a culture of openness and collaboration. From early on, when GVU students shared one lab in the College of Computing Building to today where the open floor plan in the Technology Square Research Building inspires creative encounters, the relationships among the students and the faculty have inspired new approaches to working together and tackling small and grand challenges alike. Faculty and staff who were at the original 1992 convocation of the GVU Center celebrate at the Foley Scholars Dinner on Oct. 18. 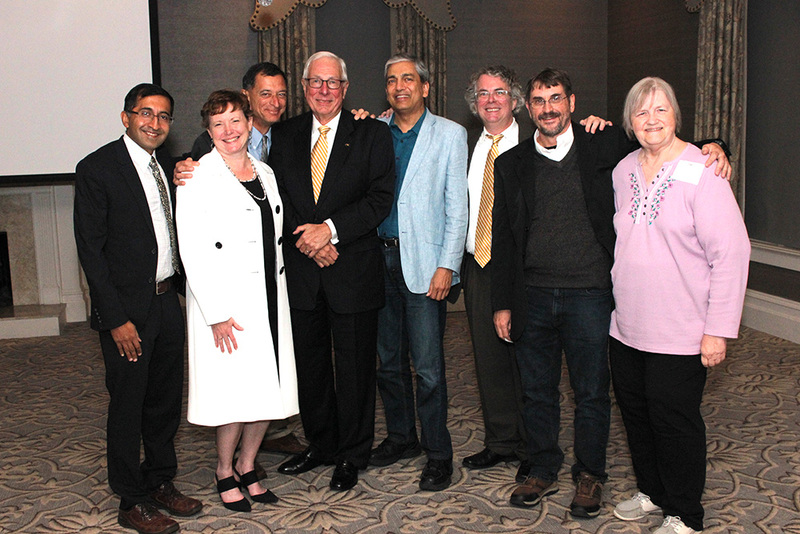 L to R: Krishna Bharat, Beth Mynatt, Richard Catrambone, Jim Foley, Ashwin Ram, Keith Edwards, Scott Hudson, and Joan Morton. 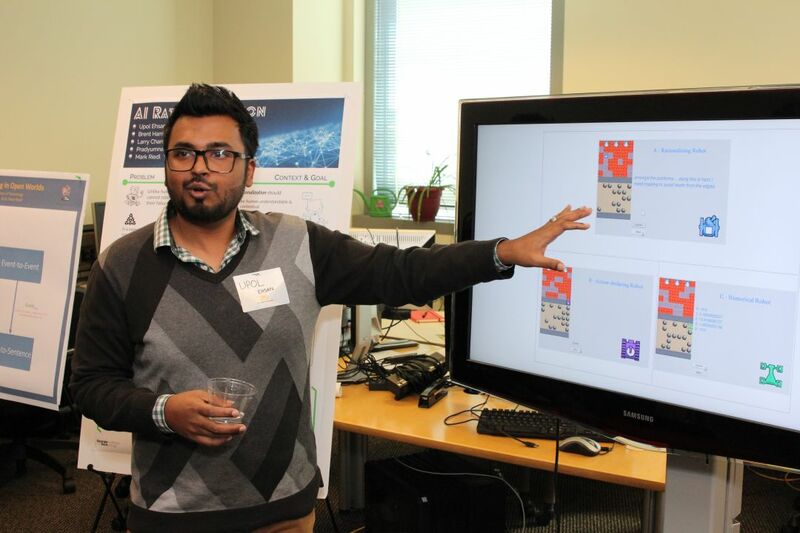 The biannual GVU Showcase is designed as an opportunity for researchers to share firsthand with visitors the computing research taking place across multiple domains in GVU. Our relationship with personal technology and how we use it is evolving. Research through our interdisciplinary teams shows the opportunities that exist for technology to address long-standing societal challenges and how we can make new connections to advance our lives and those of others. GVU's research labs are the backbone of the center's efforts to advance new and novel ways to introduce computing as a catalyst for positive change. It is the research faculty and graduate students that make these innovations come to life. Many of the faculty labs are co-located in the Technology Square Research Building as part of the thriving innovation ecosystem in midtown and where twice a year at the GVU Showcase all labs have an opportunity to connect with visitors and share their latest work. 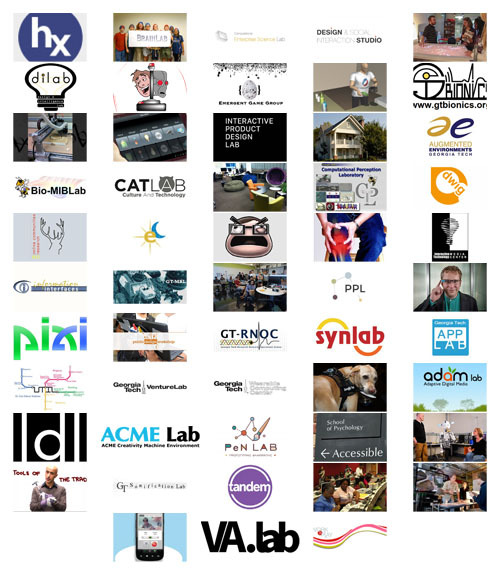 GVU supports more than 50 affiliated labs in a network that includes all six colleges at Georgia Tech as well as research incubators and industry-focused campus partners. GVU works across units to build and guide collaborations that strengthen research solutions for academia and industry. To commemorate the 25th anniversary of the founding of the GVU Center, the community honored and celebrated the contributions of a handful of passionate, skillful, and committed individuals through the GVU Impact Awards at a special ceremony on Oct. 18. Each of the individuals has played a key role in the center's quarter-century history, and embodies the interdisciplinary mindset and commitment to real-world impact that is a hallmark of GVU's identity. Through their leadership, service, and research excellence, they have changed the way computing technology is used, advanced the frontiers of knowledge, and strengthened the GVU community at Georgia Tech. 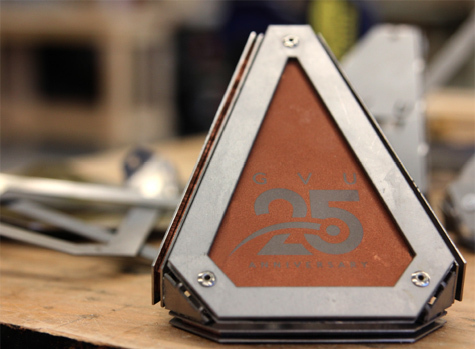 The GVU25 Impact Awards were custom-designed and hand-fabricated by Jake Tompkins of the Digital Fabrication Lab in Georgia Tech's College of Design. The awards highlight a blend of technology and artistry, reflecting the interdisciplinary spirit of GVU. Starting with a stainless steel skeleton, the design sandwiches etched glass plates within a stainless steel body, and is personalized for each recipient. Do you remember what the future was supposed to be like? How does that future compare to today? Nostalgic Futures was a special exhibition at the GVU Showcase highlighting and archiving some of the scientific and technological milestones from the GVU Center's rich history. 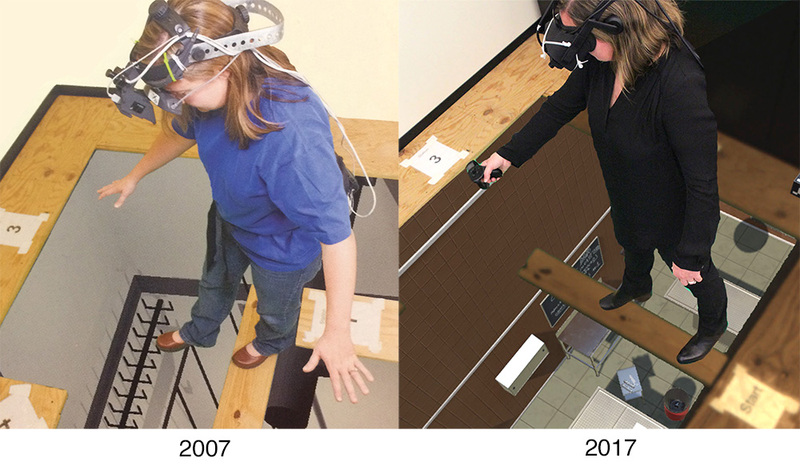 GVU researchers have consistently demonstrated being on the cutting edge of technology and interaction research, and many of the projects coming from GVU have had embedded assumptions about the direction technology would evolve. Foley Scholar Clint Zeagler and Laura Levy built the interactive exhibit of historical projects. Older computing systems were restored or replicated, with documentation from the original researchers and using current materials and technology, while maintaining the integrity and spirit of the original technology. Nostalgic Futures brought back to life seminal research that laid the foundation for several emerging technologies. Among them was the AR Pit experiment, a demonstration about the rapid prototyping capabilities of AR Second Life. The experiment is based upon an attempt to objectively measure the effects of "presence" in Augmented Reality applications and preceded popular applications of that technology by almost a decade. Pictured: Maribeth Gandy, director of IMTC, worked on the original project and helped rebuild the AR pit this year. The "pit" is what viewers see through the headset; their augmented view has been overlaid on the images to show what viewers experience. One of the displays from Nostalgic Futures shows a timeline of university research in several key GVU areas. The research helped to lay the foundation for some of today's current technologies. The GVU Center's Graduate Awards are the highest honor bestowed by the center and include the James D. Foley Scholarship and the GVU Distinguished Master's Student Award. 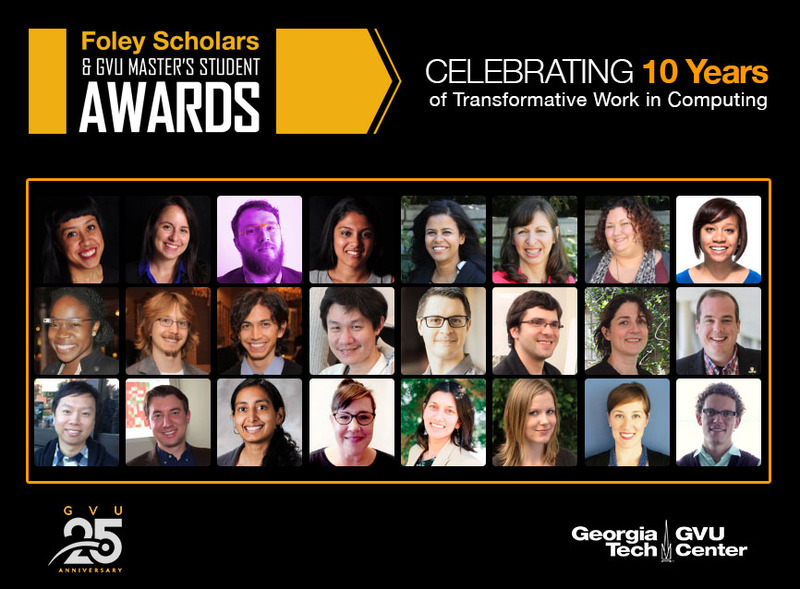 Each respectively recognizes top doctoral and master's students at Georgia Tech in computing-centered research, and this year the finalists included 12 men and women who are leading groundbreaking work in computational linguistics, wearable computing, robotics, online communities, and much more. Among the finalists, three Foley Scholars and one GVU Dist. Master's Student were named at the Foley Scholars Awards Dinner on Oct. 18. The annual event recognizes the student research and donors to the James D. Foley GVU Center Endowment, which fund the awards annually. GVU started the James D. Foley GVU Center Endowment in 2007 to honor the contributions of one of HCI's pioneering researchers, Dr. James D. Foley, and support the work of Georgia Tech graduate students working to shape computing technology for the benefit of society. The James D. Foley Scholars Program was established and the first two recipients were named in 2008. 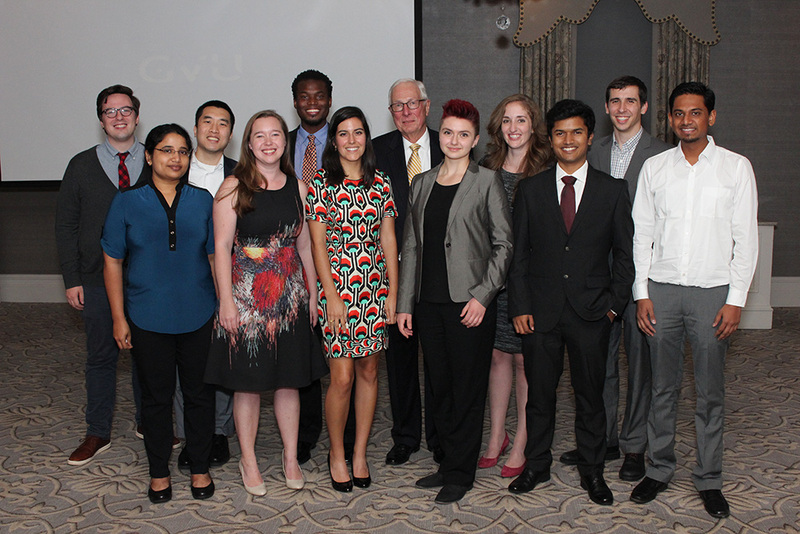 The program was expanded in 2015 to include a second award, the GVU Distinguished Master's Student Award, to recognize the critical contributions that master's students make to the GVU research enterprise. Take a look at the recipients through the years by clicking on the image below and find out where they are now and how they continue to forge a path for technology innovation. The future of interacting with and even operating computing devices may be as natural as having a conversation with these systems. Ashwin Ram, senior manager of AI Science for Alexa at Amazon and adjunct associate professor in the College of Computing gave a GVU Distinguished Lecture on "Conversational AI: Voice-based intelligent agents" at the GVU 25 celebration addressing this possible future. "As we move from the dominance of the keyboard, to that of touch screens, and now to the age of voice interaction with technology, natural conversation in everyday language continues to be one of the ultimate challenges for AI," Ram said. He said that it is a difficult scientific problem involving knowledge acquisition, natural language understanding, natural language generation, context modeling, commonsense reasoning and dialog planning, as well as a complex product design problem involving user experience and conversational engagement. His talk included issues of why Conversational AI is hard, how conversational agents like Amazon Alexa understand and respond to voice interactions, how one can leverage these technologies for his or her own applications, and the challenges that still remain. 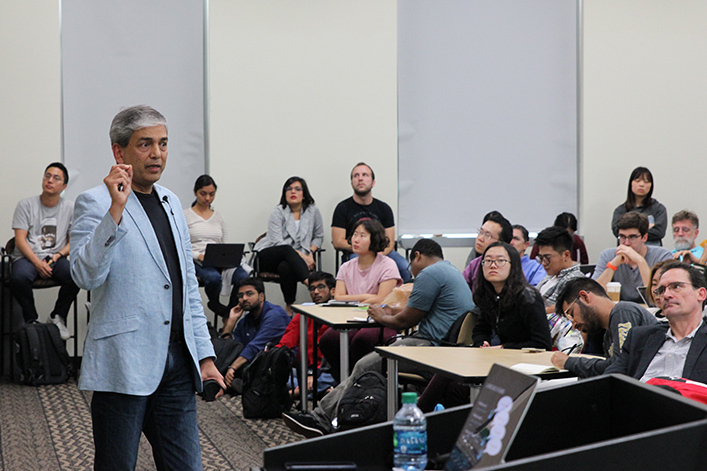 Ram encouraged the standing-room-only audience to continue tackling these challenges in AI and their applications in society. 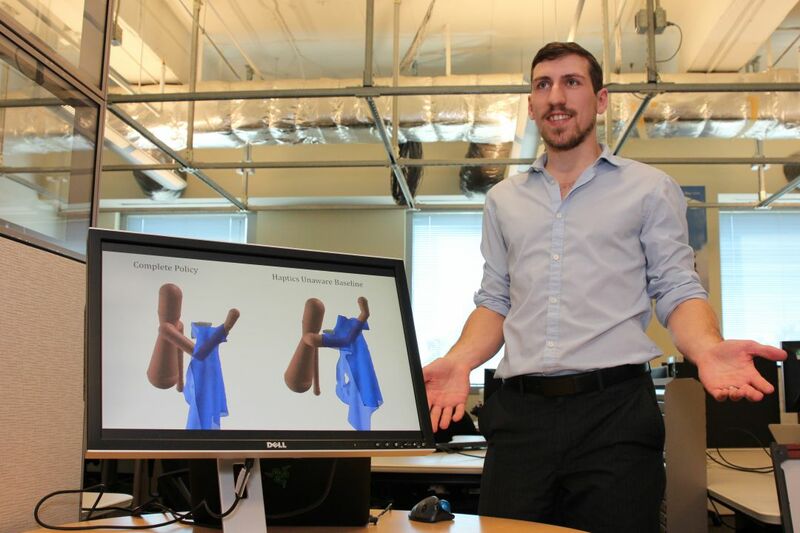 Amazon supports research funding in AI and other areas, and assistant professor of Interactive Computing Dhruv Batra was awarded funding for Visual Dialog in the latest round of awards. The GVU community extends to all corners of the globe with the work of faculty, students and alumni. 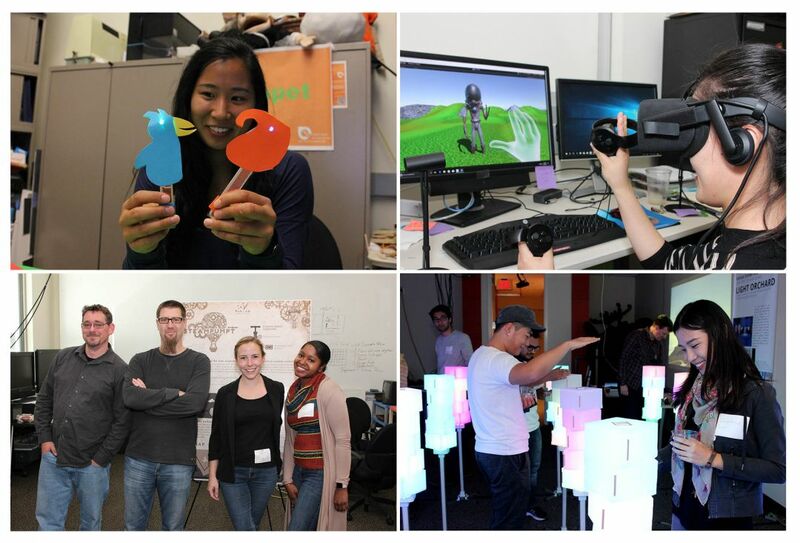 Celebrate their influence in technology innovation through some highlights from our community. 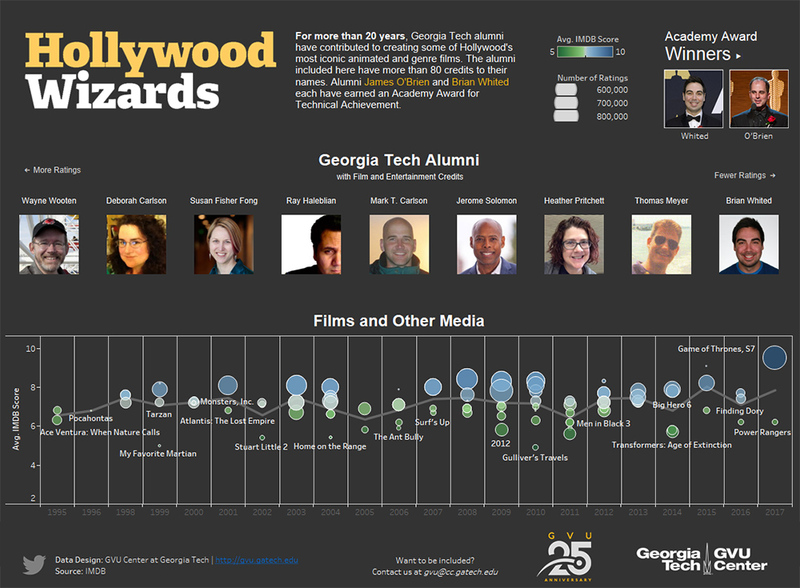 Georgia Tech alumni, many affiliated with the GVU Center, have gone on to successful careers in the entertainment business or made siginificant contributions to the advancement of animation and graphics research. Within the past two years, two computing alumni have earned Academy Awards for Technical Achievement. The alumni listed below have more than 80 entertainment credits on their resumes. Several more have made contributions to Hollywood films and other content and we will add to this list as it grows. 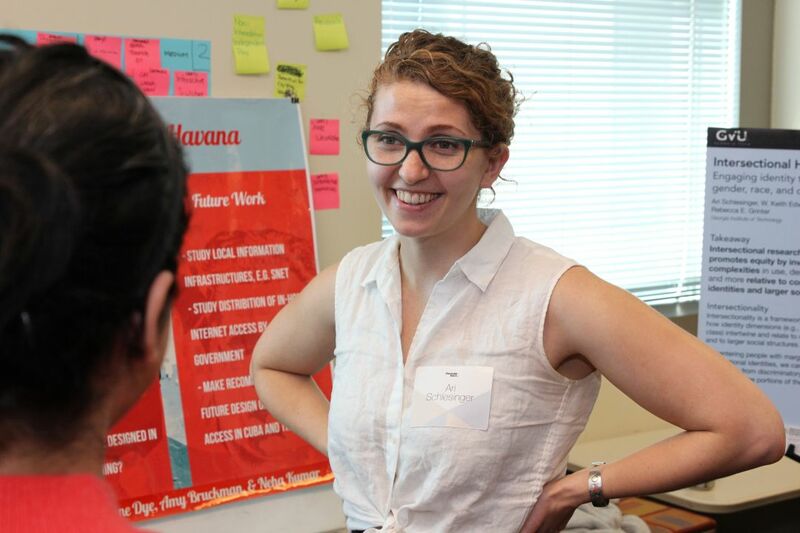 Creative Collisions, of one of four Georgia Tech projects at the Smithsonian Insititute last month, can also aptly describe the event at which it was featured in Washington D.C. The ACC Smithsonian Creativity and Innovation Festival was a gathering of all institutions in the Atlantic Coast Conference, celebrating creativity and innovation with a focus on science, engineering, art, and design. The festival featured performances, conversational talks, and 48 interactive installations from the 15 ACC schools. GVU faculty member Brian Magerko showcased LuminAI at the event alongside Laura Levy's and Clint Zeagler's Creative Collisons and two other projects from Georgia Tech.